C’mon, get with it! Get “on the ball” and fill in these missing addends with sums of 19. The first or second addend is missing in these 12 problems. 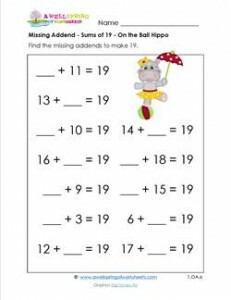 Please go to this page to see all the missing addend worksheets for sums of 16-20.